Acosta began his collegiate career at UC-Santa Barbara, then transferred to BYU where he played for three seasons. He was an outside hitter and opposite hitter at BYU, where he was named AVCA First-Team All-America in 2002. His junior season he led the team to a national championship. Competing in both basketball and volleyball in high school, Acosta was a member of the 1999 Puerto Rican National Volleyball Team. He majored in business management at BYU. 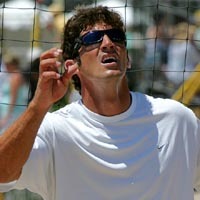 His cousin, Jonathon Acosta, also plays on the AVP Crocs Tour. Acosta, like his cousin, has passed the Bar Exam.